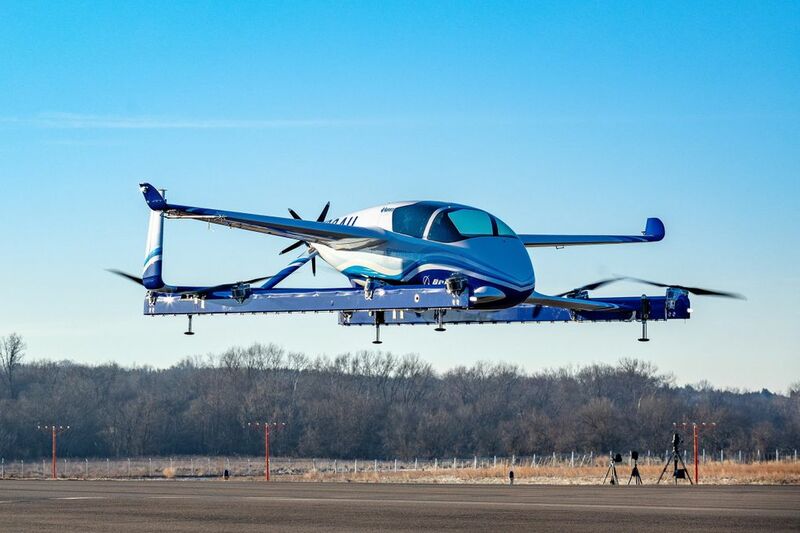 Boeing's prototype autonomous air taxi — essentially a flying car with no driver — lifted off the ground for the first time on a test takeoff in Manassas, Va., Wednesday. Still, while the technology is advancing, the regulatory and safety barriers are considerable. Boeing offered a glance at a futuristic alternative to crowded freeways when its prototype autonomous air taxi — essentially a flying car with no driver — lifted off the ground for the first time on a test takeoff. 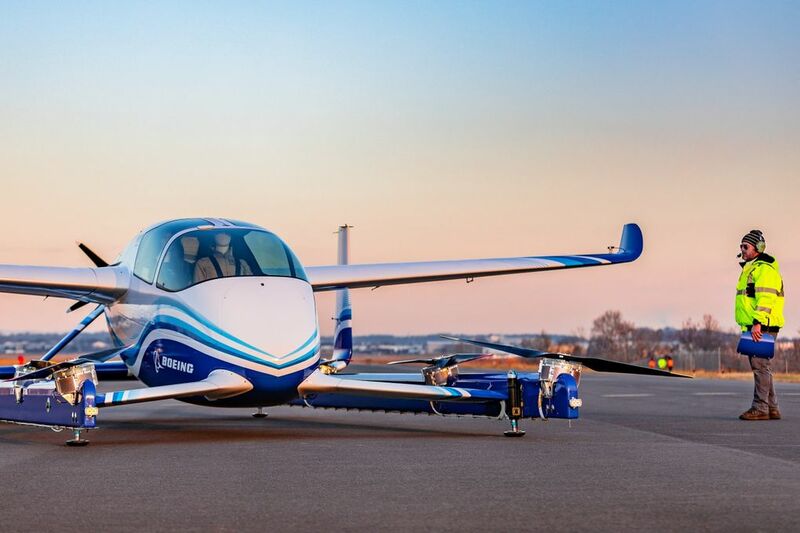 Boeing subsidiary Aurora Flight Sciences, a leading developer of innovative aircraft and autonomous systems that Boeing acquired in 2017, designed the electric vertical takeoff and landing (eVTOL) aircraft. Its first flight took place Tuesday at Aurora’s headquarters in Manassas, Va.
With a range of up to 50 miles, the air taxi is 30 feet long and 28 feet wide. Its advanced airframe uses movable propellers and wings to achieve efficient hover and forward flight. “This is what revolution looks like,” said John Langford, Aurora’s president and CEO. He said the key to the technology will be autonomy — the aircraft is intended to fly itself, using sensors and artificial-intelligence software to avoid obstacles and other flying vehicles as it delivers passengers. Other companies are also rushing to develop similar air taxis to open up the urban skies, supplementing the current clogged ribbons of roadway with flight paths crisscrossing the three-dimensional space above our heads. A year ago in Pendleton, Ore., European jet maker Airbus completed a similar test takeoff of its Vahana autonomous air-taxi prototype at a drone test range, the aircraft rising 16 feet into the air and then descending safely. The next step in these flight tests will be much more of an engineering challenge: transitioning from the vertical takeoff and hover phase to forward, wing-borne flight. Many other startups are exploring the same urban air mobility concept. And Uber, in a partnership with Aurora Flight Sciences that predates Boeing’s acquisition of the company, is developing an urban aviation ride-sharing product called Uber Air, which it claims will be available by 2023 in Dallas and then in Los Angeles. But Uber’s vehicle hasn’t flown yet. And don’t expect to see air taxis in the skies above Seattle for years. While the basic technology is advancing, the regulatory and safety barriers to deploying it are considerable. Uber ride-share cars stopping in the middle of the narrow streets of South Lake Union to drop off or pick up Amazonians are already a road hazard at peak commute times. Imagine dozens of air taxis converging on the area as executives try to beat the bridge and tunnel traffic. And realize that in this imagined future, these air taxis will share the air not only with the Kenmore Air seaplanes landing on the lake but with thousands of Amazon package-delivery drones flying low across the skies. Boeing is separately developing an unmanned, fully electric cargo air vehicle designed to transport up to 500 pounds. It completed an indoor flight last year and will transition to outdoor flight testing this year. Even a potential killer app for urban air taxis — whisking passengers arriving at Sea-Tac International Airport to the heart of downtown Seattle — in reality looms as more of an air traffic safety nightmare when you think about pilotless air vehicles and fully loaded passenger planes flying anywhere near each other. To address this challenge, another Boeing subsidiary, NeXt, is working with regulators and others “to lead the responsible introduction of a new mobility ecosystem and ensure a future where autonomous and piloted air vehicles safely coexist,” Boeing said in a statement. At an air safety conference in Seattle last November, Boeing CTO Hyslop talked about how air mobility can overcome the shortcomings of the increasingly overburdened “terrestrial infrastructure” as the world’s cities grow ever bigger. He said he can fly from St. Louis to Chicago in 44 minutes, then spend an hour and a half in a car driving to his office from O’Hare airport. Tuesday’s test was just the first little hop into the air. Aviation expert Richard Aboulafia of the Teal Group is a skeptic. “The costs will be way higher than planned. Utilization, as a result, will be much lower than anticipated,” he predicted. In reality, this air taxi technology will likely debut as a passenger service not in the U.S. but somewhere with a government that can completely control conditions and has plenty of money to pour into the system. Rather than Seattle or Dallas, expect to see air taxis in action first somewhere like Dubai. German drone firm Volocopter flew a prototype two-seater autonomous aerial vehicle there in 2017. Correction: This story was originally published Jan. 23, 2019, and corrected the same day. An earlier version of the story incorrectly said the test flight took place Wednesday. Dominic Gates: 206-464-2963 or dgates@seattletimes.com; on Twitter: @dominicgates.